I really have to stop doing this to myself. I would rather be making jewelry than listing it, so I end up with a big pile of pieces sitting here beside me staring me in the face. If I had an assistant (or a genie), I would make them do all the photography and listing. And probably shipping, too, because that's just how I'd be if I had an assistant (or a genie). Meanwhile if you're looking for me, I'll be here all afternoon listing pieces in my Etsy shop like all these sparkly bracelets in teal, blue and green and matching earrings. There's more, too, so if you've been waiting for some new things to hit my shop, here's your chance! I have such news! I have taken my first lessons in macrame this week, and I'm positively twitterpated! 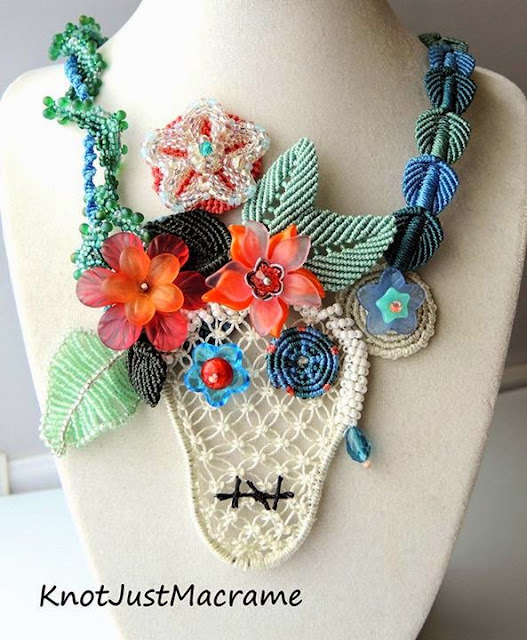 I have long admired the style of macrame I think of as South American. I really am not sure where it originated, but I see quite a bit of this style from people from Brazil, Argentina and Uruguay, etc. 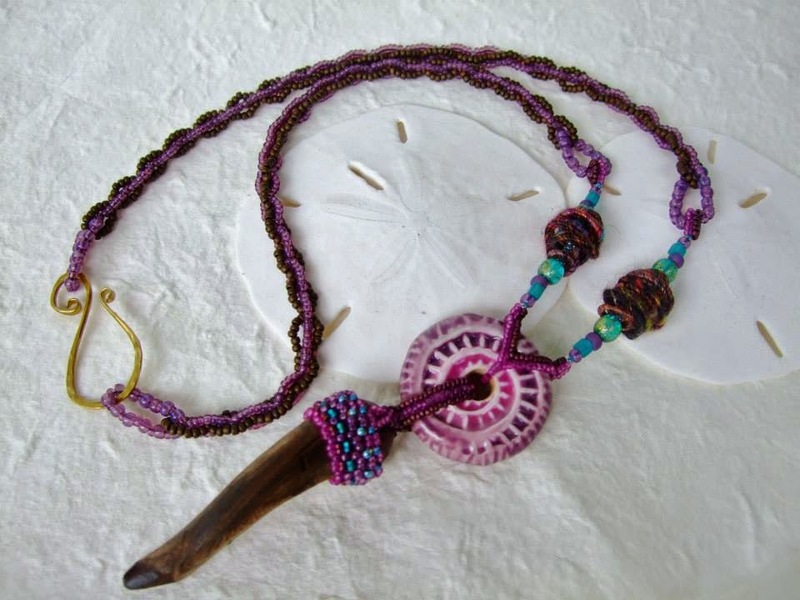 The pieces I'm talking about are usually done with waxed cord and natural stones as opposed to the nylon bead cord I use and the glass seed beads. The emphasis is on the knotting. The style is less "fussy" than mine, maybe. More natural, more organic. I don't mean to imply that folks in other areas of the world don't do that style, because some certainly do. In fact, my teacher is from Estonia. If you follow the world of macrame, you may have come across some of the work of Percy Palomino Tomayquispe. I don't want to filch any of his photos to put them here to show you, so I'll just give you this link to his Facebook page. Prepare to be amazed. 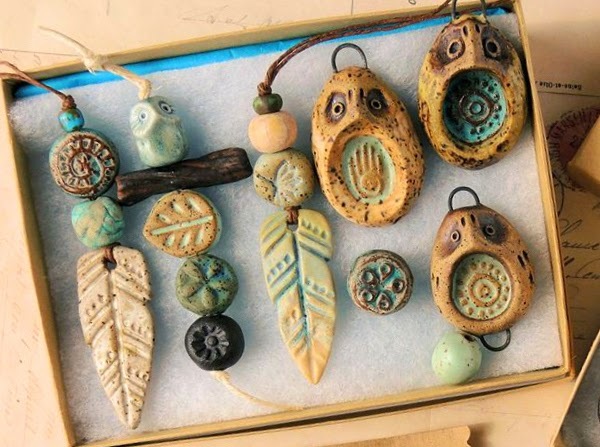 Anyway, back to my story... we don't have a local bead store in my town (the nearest is about 150 miles from here) so classes for me would require travel. And I'm a homebody (okay, some would make an argument that the correct term would be recluse). Either way, I've never taken any macrame classes or any jewelry making classes either, so when Percy announced that he would be doing online classes, I jumped at the chance. Turns out I'm not the world's best student. I asked Percy to teach me bezeling because I've never quite been able to get it down as well as I'd like. Those two pieces in the photo above are my first two failures even after Percy's lesson! Third time is a charm though, and I finally nailed it. After a second lesson, I also got the back done to hold the cabochon in place. It may not look like much, but I am learning and enjoying every second of it. And even if I'm not the best student, I am a determined one! I'm also thrilled to have such an opportunity. I grew up in the TBI (time before Internet), so it is still a big deal to me that we can interact with folks from the other side of the globe with such ease. What a learning opportunity. I'm just going to show you this little teaser here. If you want to see the whole piece she made, you'll want to pop over to her blog. It's worth the trip, let me tell you. After she set the bar so high, I was really sweating my piece using her beaded components. For some reason I was set on trying to make a sugar skull and since I've never tried knotting one before, it was a lot of trial and error. My pieces are usually fairly simple, but I wanted something much more complex for Lindsay. I struggled. I'm still not quite happy with it. I think now that I have to remove the top coral colored circle with the seed bead flower in it. Or maybe move it more to the left - I'm not sure. 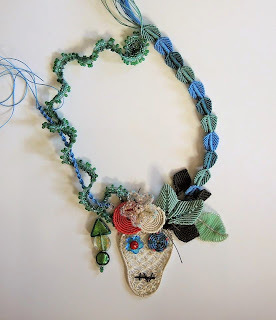 At this rate, Lindsay might get this necklace in time for next year's Day of the Dead. It's a good thing she's patient. 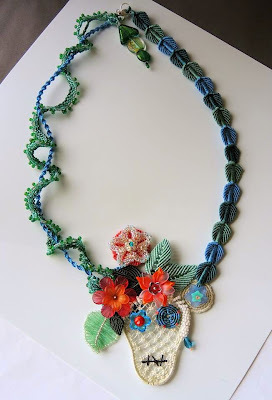 If you follow the Art Jewelry Elements blog (and if you don't, you really should! ), you know they do a monthly component challenge and giveaway. I was one of the lucky recipients this month and I received one of Karen Totten's Spiral Fossil Discs! In an effort to mimic but not copy her design exactly, I started with an antler tip that my dad gave me and knotted around it. I've seen this technique before in some South American macrame designs, but I hadn't ever tried doing it myself. They typically use a waxed cord which gives it a little tackiness and I wasn't sure how the process would work with the unwaxed nylon cord I use. I made sure I knotted my first row very tightly around the antler (which is actually the bottom row in this photo). The antler angles out a little bit at the top, so that first row of knotting actually holds the antler in place. 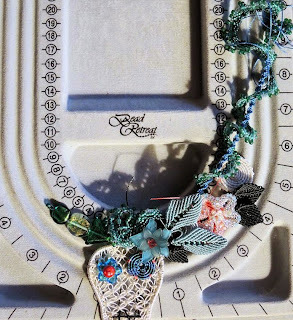 Linsday chose a y-shaped yoke for the top strap of the necklace in order to cover as little of Karen's disc as possible. 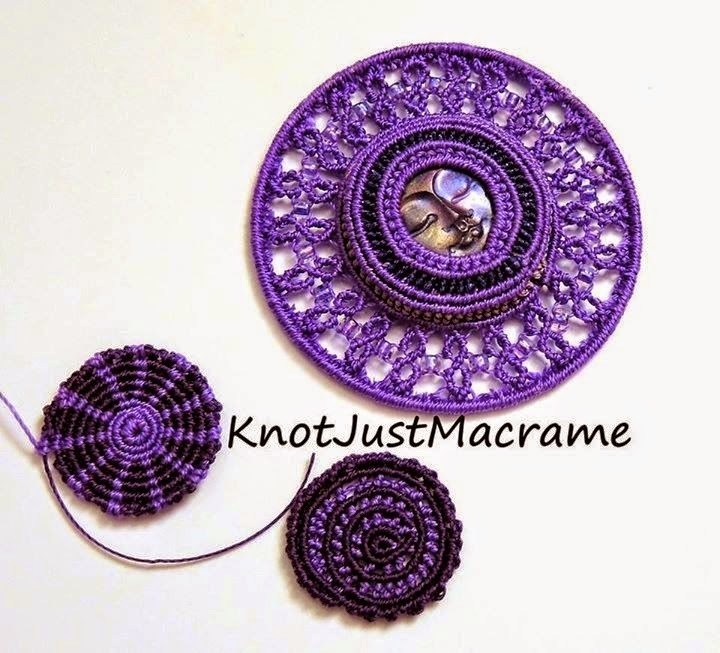 I chose to do two separate straps of macrame, but I kept them narrow around the disc for the same reason. In keeping with the sort of rustic, organic feel of the piece, I chose some carved bone beads to use directly above the disc in a light color to pull in the color from the antler tip. From there I added some basic square knots in the teal colored thread. The beads I used in the strap are recycled glass from Ghana. They are made by crushing discarded glass and adding a colorant. The powder is poured into molds and the stem of a plant is added, which burns away during the firing leaving a hole for stringing. The beads are fired in a wood burning earthen oven. The look is crude and primitive and perfect for this project. I used simple half knot sinnets for the bulk of the necklace straps. The spirals catch the light in interesting ways and draw the eye to their twists and shadows. At the end I added a few more glass beads and a simple brass hook closure. 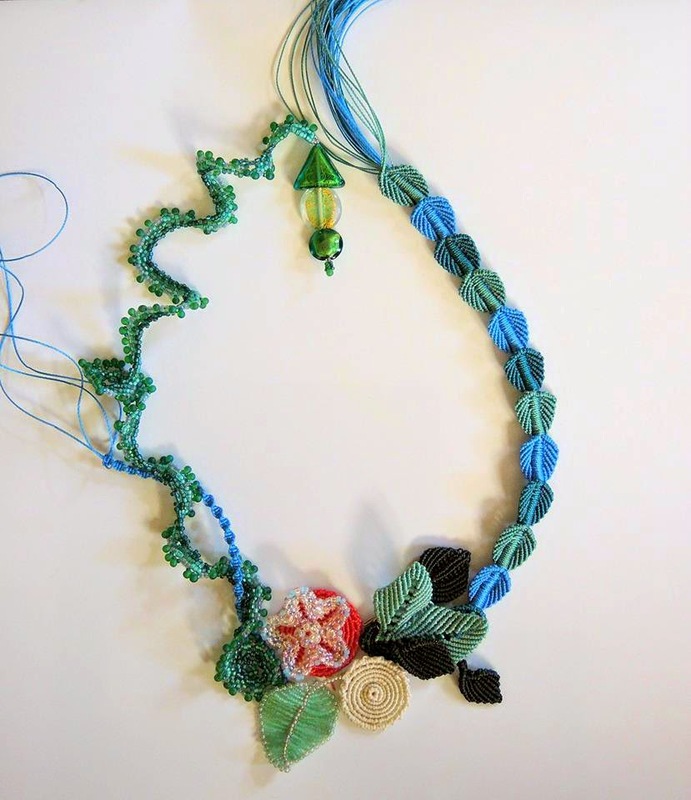 I think it's a fun piece and I've really enjoyed the study in "compare and contrast" with Lindsay's necklace. I hope you'll visit her page, then stop back to tell me what you think. What similarities did you spot? What differences? 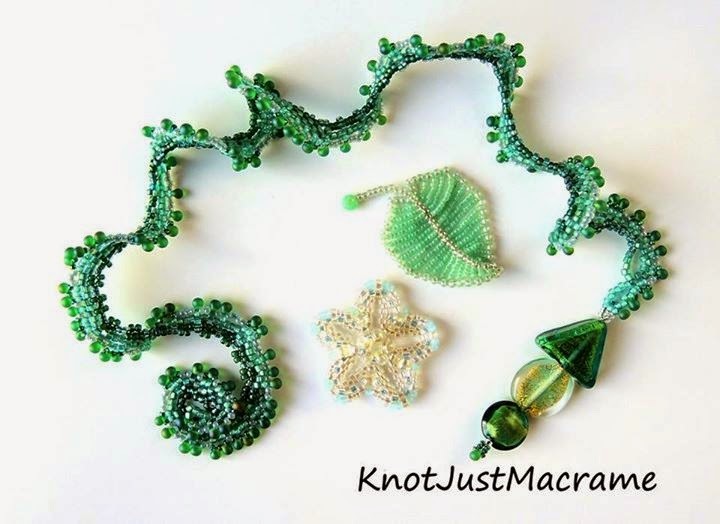 Which elements worked better with beads and which did you like better with knots? 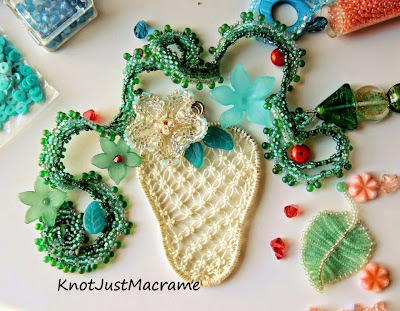 Sherri Hartman Stokey / Knot Just Macrame <--that's me!